The target on this occasion was the Russians , who had been bullying the Turks , for want of anything better to do , and seemed to be available at the time . The result was really a bloody and pointless stalemate , the victims being thousands of soldiers on all sides , to say nothing of the civilians in Sevastopol . The British Army that landed at Calamita Bay and marched upon Sevastopol with their French allies was mostly inexperienced : it was thirty years since their last big campaign , and everything so painfully learnt in Spain had been forgotten, particularly regarding the commissariat. Otherwise not much had changed , including some of the officers , who were getting a little old for this sort of thing.The younger ones had mostly never been under fire. If the officers were wanting , the men were magnificent : very largely long service regulars , well drilled and amazingly motivated . And they started the War in full-dress : nothing less would do to confront a major European Power. The first battle , at the crossing of the Alma and the storming of the Russian fortified position on the hills beyond , was an ill-commanded mess , won by the persistence of the men rather than any great inspiration or tactical skill by their commanders ; though as usual some of the junior officers behaved magnificently. All three Regiments of Foot Guards were present in the 1st Division , and with the Highland Brigade on their left were largely responsible for deciding the battle…. though credit must also be given to the Light and 2nd Divisions who started it and broke the Russians morale, then got themselves in something of a pickle , and the French who turned the Russian flank with great elan . The Guards , forming the 1st Division, were rather slow in crossing the river and getting on to the battlefield , because their commander , the Duke of Cambridge , was in a funk . 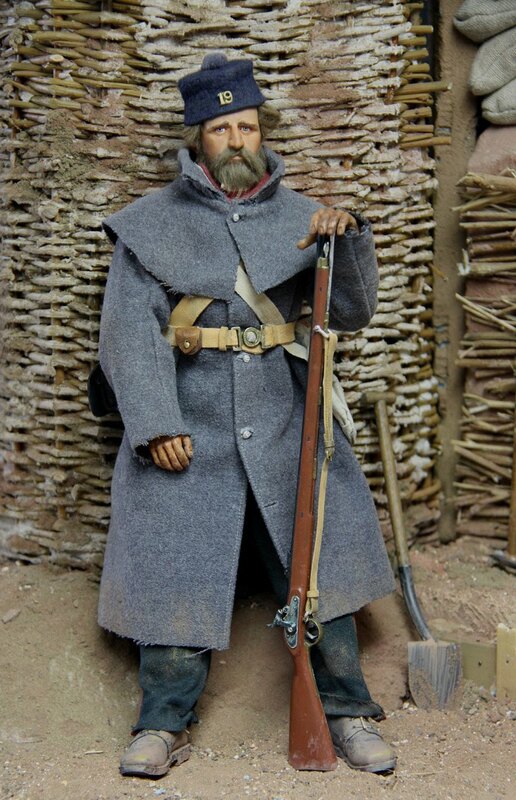 The Light & 2nd Division had already taken the Russian batteries , but had been forced to retire from them by the Russian Infantry counter-attack , and were broken into jumbles of men , all blazing away but without the leadership to reform and advance… many of the key officers were dead. The Guards, with the Highland Brigade on their left , advanced , deploying into Line. 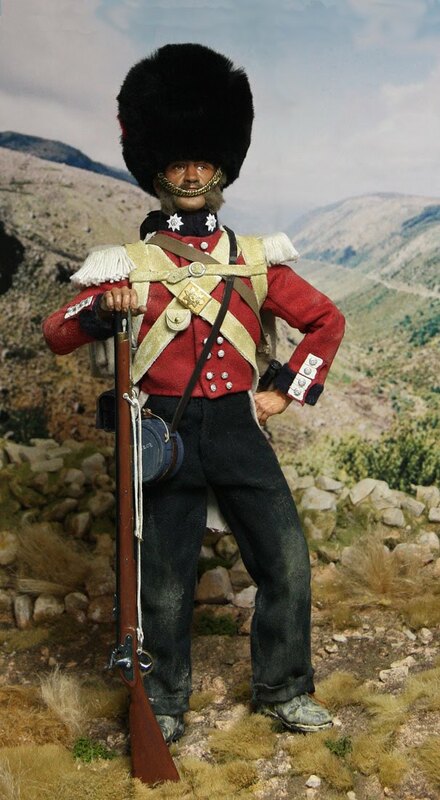 The Scots Guards were in the lead, and got into difficulties because of the broken terrain , but the Grenadiers and the Coldstream came up behind them " like a moving wall ", file firing as they came, and settled the issue. The Minie rifle really proved its worth in this and subsequent battles : it was accurate out to at least 400 yards , and gave the British & French an overwhelming advantage. It was calculated that the old smoothbore musket , with which the majority of the Russians were armed, produced 1 hit in every 400 shots fired. The Minie was capable of 1 in 16. It’s astonishing that the Russians stood it so well , and for so long : their artillery was plentiful and formidable , which certainly helped their morale , but their unfortunate infantry was arrayed in deep columns which made them unmissable targets, as well as restricting their fire to the front two ranks. The rest were just there to be shot at. .
A Russian officer , used to handling Infantry in those dense columns , wrote in his diary that it was was astonishing that men could be found with the morale to make an attack in a broken two-deep line . From an otherwise rather dim constellation of British generals in the Crimea, Sir John shines out as a genuine leader. Born in 1800 to an Anglo-Irish family in Tipperary , he served in India during the conquest of Scinde where he was wounded and afterwards knighted. 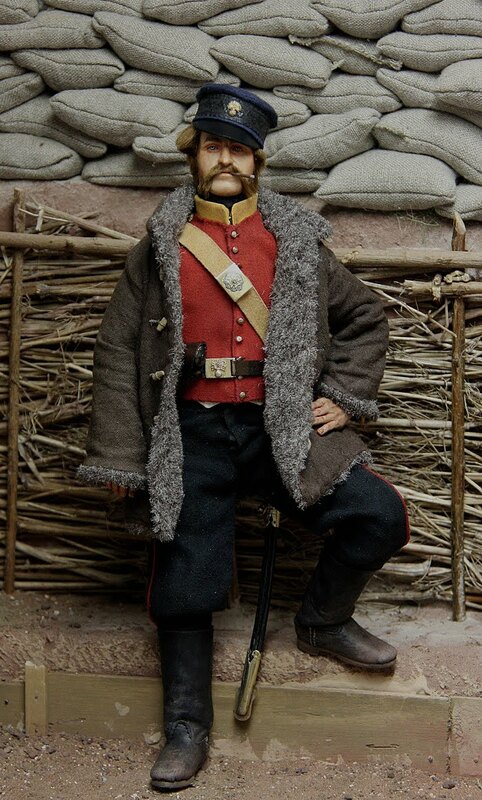 By 1854, he was appointed to command the 1st brigade of the 2nd Division , which he commanded at the Alma .The sickness of the commander of the 2nd Division left him to take command , and he happened to be the man on the spot on the 25th November when the Russians launched their attack at Inkerman. All morning, in the fog, he rode about through shot and shell encouraging the men , swearing prodigiously , and launching counterattacks whenever he could get enough men together , in an attempt to keep the Russian columns deploying out of the ravines up onto the open ground : " Fire a volley , and go at them with the bayonet .."
When Raglan arrived , the CinC had the good sense to leave him to finish the job. 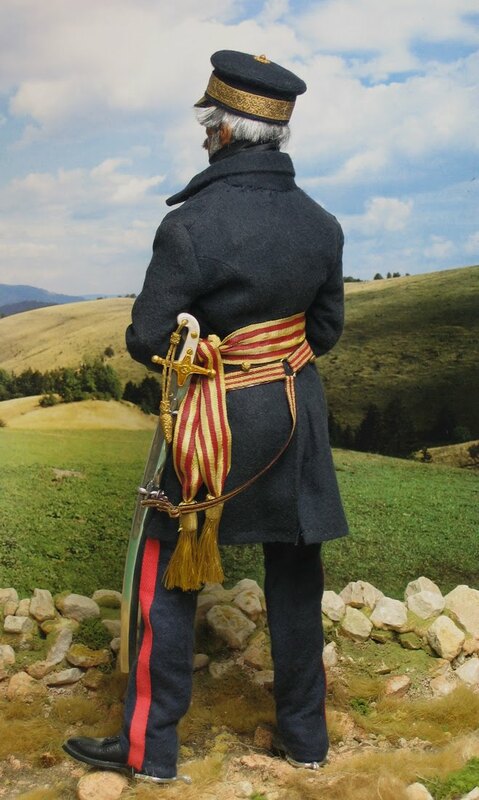 As Sir John said afterwards, " I tell you , we gave them one hell of a towelling .."
The outfit is typical of the field dress affected by senior officers : undress frock-coat , overalls and forage cap. The sword is the 1831 mameluke General officer's model. There are four photographs of him taken by Roger Fenton in 1855 in the Crimea , and a sketch done in old age, so I used those to make the portrait.The whole outfit is made in brushed cotton , which is a reasonable scale substitute for broadcloth . The sword is cast in pewter and gilded. Sir John died , a full General and GCB , Governor of the Royal Hospital at Chelsea, in 1872. The full-dress headgear of the Albert shako was rapidly abandoned, even as soon as the firing started at the Alma. Whole lines of shakos were found after the battle, lying where the men had gleefully dumped them , and from now on the ordinary soldier wore his forage cap , a knitted Kilmarnock. 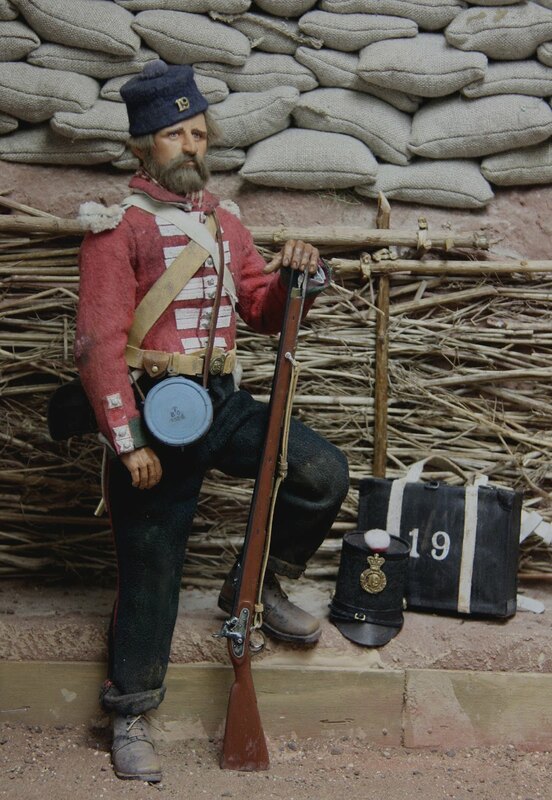 The 19th , alternatively known as the Green Howards , are typical of the bulk of the British Infantry, and a good selection of their items survives in the Regimental Museum in Richmond. 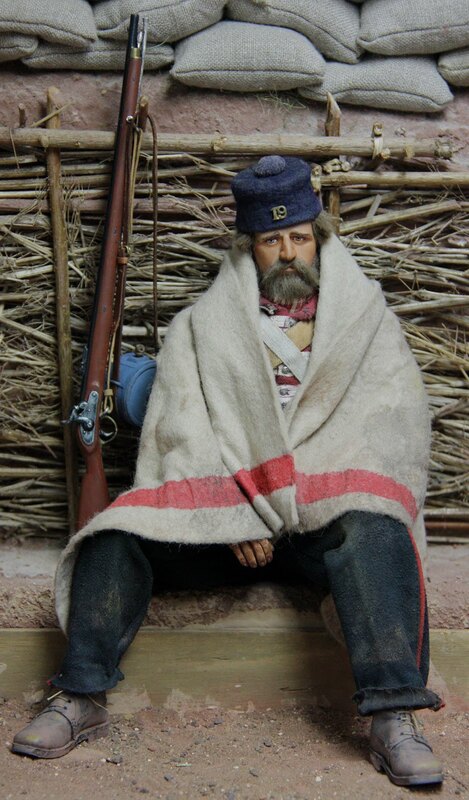 The uniforms deteriorated very quickly, first under the broiling sun , then under the worst a Crimean winter could do to them.The sufferings of the troops during the first winter are well known : suffice it to say there was no winter clothing beyond the greatcoat and blanket they had carried ashore. The knapsacks had been left on the ships ,where they were promptly emptied by some very naughty sailors, so when the soldiers finally got them , there was nothing in them. So the men endured what rapidly became a tedious siege wearing what they had walked ashore in , and anything they could scrounge . They rapidly mdofied what they had to create the appearance above : I have included the shako and knapsack . 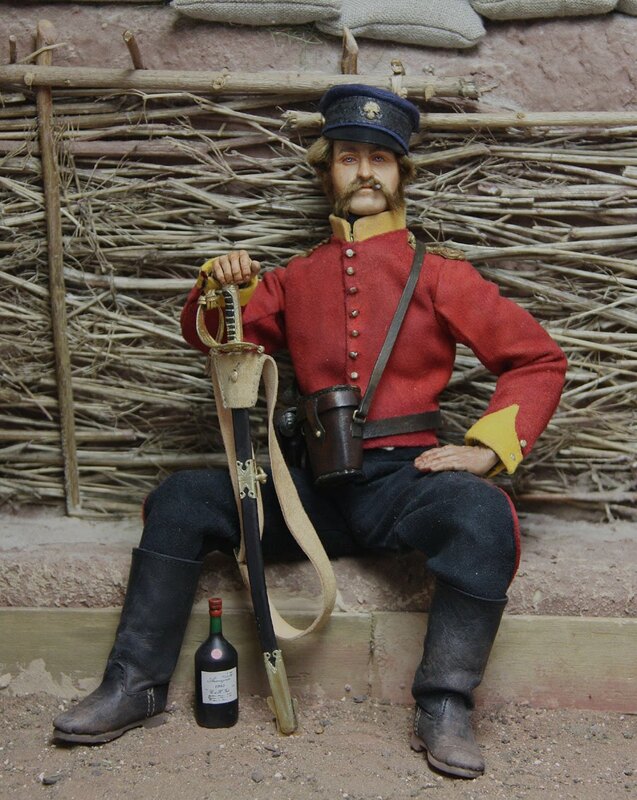 The 19th took heavy casualties at the Alma ; were scarcely involved at Inkerman ; spent most of 1855 serving in the trenches, but suffered severly again in the bungled and failed attempt to storm the Redan in September. I hope he sums up the miseries of this unnecessary war. This is an Infantry officer, on tour of inspection of the trenches . Henry Fortnum Augustus Bounder , of Bounder Hall near Wedlock in Derbyshire , is an invented character , somewhat along the lines of Flashman,but less intelligent . He is in all aspects typical of officers in the Crimea, and actually from the 95th,2nd Derbyshire Regiment . He wears a forage cap and shell jacket beneath a " Bunny coat " , which were private purchase items highly suitable for the colder weather. He has also looted a pair of Russian boots. 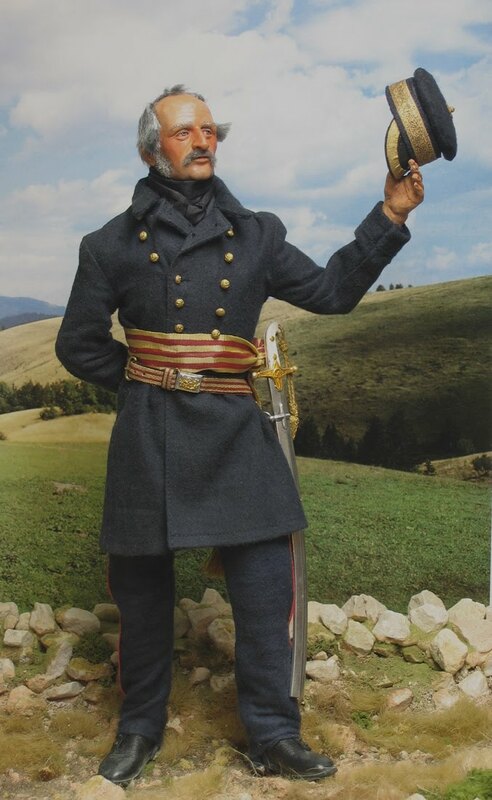 His 1822 sword is carried on a shoulder belt, still issue for junior officers, but he also has an Adams revolver , which was the British answer to the Colt , unveiled in competition with that weapon at the Great Exhibition of 1851. The Adams was more robust and fired faster , but was a deal more expensive since it was handmade.